A yoga practice typically finishes in a pose that looks like bedtime. It’s called savasana. You lie on your back and relax your muscles and mind. I saw the power of relaxation when a 13-year-old boy in the first yoga class I taught in The Dalles, Oregon, my hometown, fell into a deep sleep. His mom was ready to take off, and he was snoring on the floor. In 2014, I came back to Central America – the first time was a study abroad experience – to work in Honduras with a nonprofit called Global Brigades, an organization that seeks to alleviate poverty by working with community members to establish infrastructure for health and the economy, including clean water. Though we focus on rural and impoverished communities, I work in an office smack dab in the middle of Tegucigalpa, the capital city of Honduras. By reputation, the city is ridden with poverty that yields gang activity, homicides, unabashed assaults and armed robberies. I’m happy to share I’ve experienced the contrary. In fact, I think it’s part of my vocation in life to upset stereotypes and omit expectations. Life is richer without those things. Still, just like the stereotypes tell you, Tegucigalpa has pockets of danger. People do go around with a sense of caution and distrust. And day after day, that gets to be a heavy load. So, beyond my work with Global Brigades, I instruct yoga classes and invite my students to release their heavy loads and recognize grace and peace. I completed a yoga teacher certification program through Yoga Alliance shortly after graduating from Cal Lutheran. My favorite class to teach is a free session held once a month in El Picacho, a park located to the city’s far north. An average of 50 people attend, and other parkgoers stick around to watch the movements and stretches. Many of my first-time students in El Picacho tell me they haven’t visited the park in years. 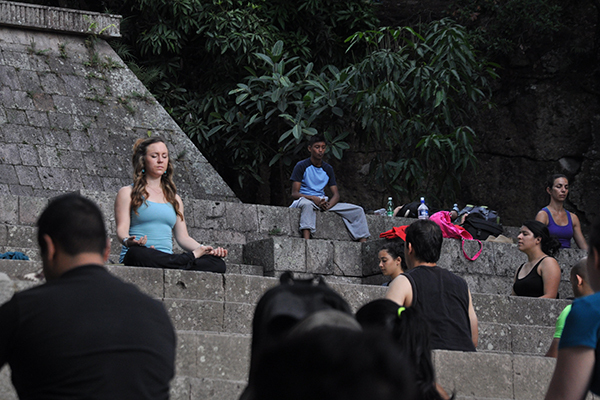 They reencounter this sacred space in nature because the yoga class draws them there. Similarly, many of my metropolitan students at this class rarely take the time to relax and feel tranquility. Every month when the class members rest in savasana, their lungs filling with air rich in oxygen as their chests rise and fall, their faces forming calm and easy smiles, the sight looks to me like peace and hallelujah. A stereotyped image of life in Honduras doesn’t leave much room for peace and hallelujah. I am blessed to have encountered these moments that were never constructed for me in photos, travel blogs or mass media. I think my vocation is to encourage grace in others while acting outside the boundaries of stereotypes and expectations. Teaching yoga helps me to do this in body, mind and spirit. I invite you to lighten your load and take multiple deep breaths. As we say in Honduras, disfrute el ambiente. Enjoy being where you are, it’s divine. Namaste.